SPY rose 3.8% this week, while my account fell 0.1%. Next week is expected to be about the same. TNA: Sold due to drop in MACD, but then the market “melted up” for the Santa Clause rally. MACD does not do well with melt-ups, but TRIX does. Perhaps I should use both indicators? 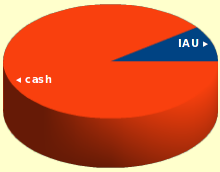 IAU: Doing okay. Sell next Friday unless it does very well and my stop rises above break-even. TNA: As usual, the model bought for a better price than I did, but I sold for a better price. Managed to break even, during a week when this ticker rose a lot. TNA#2: Skipped this trade bacause PPO-signal was positive. Avoided a loss.